Notable features First appearance of Winky. 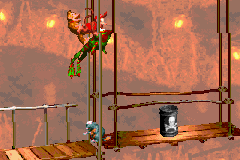 Winky's Walkway is the first level of Monkey Mines, the second world in Donkey Kong Country. It is available after defeating Very Gnawty. Winky jumps over a Gnawty in the Game Boy Color version of DKC. As the level's name suggests, it prominently features Winky the Frog, who also makes his first appearance here. The level consists of an odd series of walkways, riddled with Kritters, Gnawtys, and a few Necky enemies. The level also introduces Skull & Crossbones Barrels, a type of immovable, indestructible barrel that infinitely spawn a particular enemy. In this stage, they all spawn Gnawty enemies. Donkey Kong and Diddy Kong can utilize Winky to help them get from walkway to walkway, in addition to defeating enemies. Winky appears in an animal crate early in the level, beyond the first series of walkways -- simply jump on one of the two Neckys to reach his crate. Winky is best used to reach Bananas, some K-O-N-G Letters, and a bonus stage. This level is considered the shortest level in the game. The level was lengthened in its Game Boy Color release, however its Game Boy Advance release kept the level at its original size. Completion of this stage will unlock the stage Mine Cart Carnage. In the Game Boy Advance remake, it will also allow the heroes to visit Cranky's Cabin. Winky the Frog: Found near the beginning of the level, guarded by two Neckies which can be jumped to to reach his crate. Animal Tokens: Expresso's Animal Token is guarded by a lone Zinger circling it; The player can either do a well timed jump or have Winky defeat the Zinger easily. In the Game Boy Color remake, it was moved to be above a Necky found shortly after the Star Barrel. Extra Life Balloon: Only in the GBC version, a Red Life Balloon is found near the end by jumping on a Zinger. 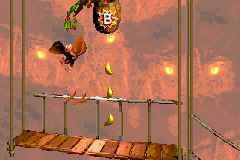 Diddy uses Winky to grab Bananas in the bonus stage, as well as the "N" Letter. K: Near the start above a Necky. O: After getting Winky, the O is high up in between two platforms to the right. In the Game Boy Color remake, it is in the bonus stage of the level. N: Found in the only bonus level in the level, near the center of the platform. In the GBC release, it is mid-air between two walkways. G: Near the Zinger guarding the animal token, there is a Necky nearby that is flying up and down, which can be jumped on to reach it. In the GBC remake, it is on a raised platform that Winky can reach, or a regular Kong can jump off a Necky to reach. Star Barrel: Closely after the "O" letter on a gray platform. Collect the Prizes: This level is in plain sight after the Star Barrel, guarded by a Necky. Those who don't have Winky will have to stomp on the Necky to reach it. Inside, there are a bunch of bananas and the "N" KONG Letter. In the Game Boy Color remake, there are less bananas and the letter was changed to the "O" Letter. A Gnawty appears out of a Skull & Crossbones barrel. Winky jumps over a Gnawty. Winky leaps to the Bonus Barrel. This page was last modified on 7 November 2016, at 20:56.